This isn't your average grocery-getting, haul-the-kids-to-practice SUV. Dustin Powell's Trailblazer SS is a legit, 1,000hp monster. “What’s better than a 1,000+ hp grocery getter that also hauls the kids around?” ponders Dustin Powell, the builder behind this LS3-powered sport-utility. The owner of a heating and cooling company in central Illinois, Powell originally brought home the Trailblazer in 2013 with the intention of using it as a garden-variety family vehicle. With 9.4:1 compression and a Callies Performance crankshaft and connecting rods, dished Wiseco pistons, a custom camshaft from GP Tuning, Trick Flow cylinder heads, and a Holley Hi-Ram manifold, Powell’s motor was pretty stout in naturally aspirated form, but the combination was also ripe for the addition of forced induction. As many projects do, Powell’s started out with the intention of keeping the build relatively sane. The original LS2 was swapped for an LS3-based 418ci stroker motor from NCP Speed and Machine, while a set of KW coilovers gave the suspension a more performance-oriented mission. The new, naturally aspirated power plant was good for roughly 500 horsepower at the wheels, which was enough to push this big brute to an 11.70-second quarter mile pass, making Powell’s truck one of the quickest naturally aspirated all-wheel drive Trailblazers around. The factory-installed LS2 was one of the first things to go, replaced by an LS3-based 418ci stroker motor from NCP Speed and Machine. That would likely be enough for most, but it wasn’t long before Powell was once again on the hunt for more performance. He decided it was time to bring forced induction into the mix. Sporting a boost-friendly 9.4:1 compression ratio, along with a Callies Performance crankshaft and connecting rods, dished Wiseco pistons, a custom, CAM MOTION camshaft from GP Tuning, Trick Flow cylinder heads, and a Holley Hi-Ram manifold, the LS3 was already well-equipped for the job. Powell sent the SUV off to BNM Perfomance in Springfield, IL, to have a custom turbo system fabricated. 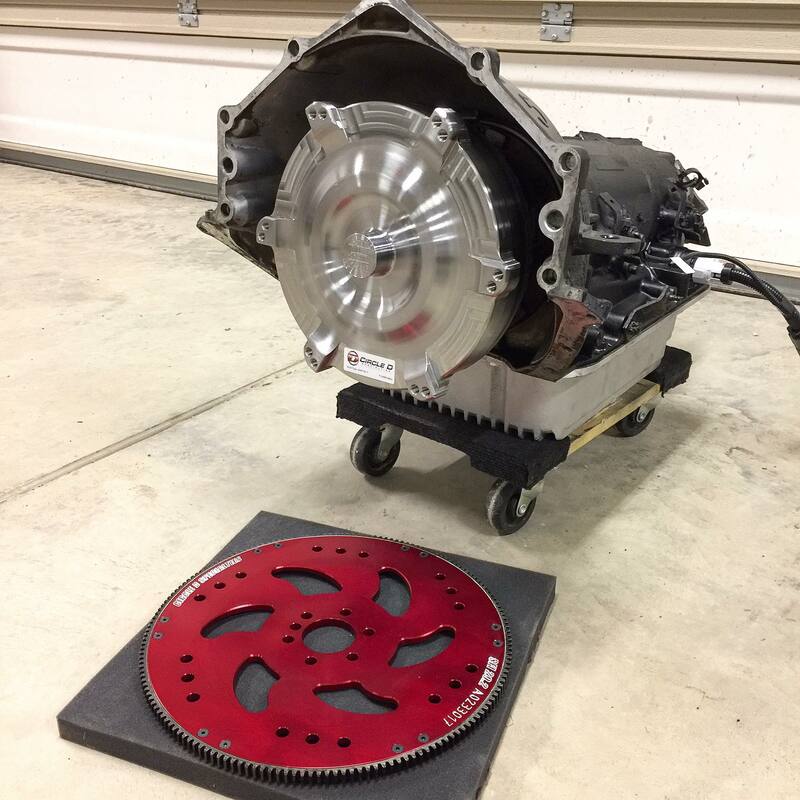 Once Powell was ready to add boost, he sent the Trailblazer off to to BNM Perfomance in Springfield, IL to have a custom turbo system fabricated. An 85mm Borg Warner turbocharger supplies the boost. To give the Trailblazer a more purposeful stance and help put the power to the ground, the truck now rides on HRE wheels wrapped in drag radial rubber out back. The suspension was upgraded by way of a set of KW coilovers. In terms of the Wiseco pistons used in the LS3, Powell reports they’ve proven to be more than up to the task of handling the rigors of low 10-second hauls down the dragstrip. While the Trailblazer is already making roughly 920 horsepower at the rear wheels with its current 11.5 psi tune, Powell says there’s plenty of room to grow once the 4L80e transmission is swapped for something that can handle more power. “After doing a fair amount of research on what pistons to go with, as well as talking with my engine builder, we decided to go with Wiseco pistons,” Powell says. With the current setup, this truck has set a personal best e.t. 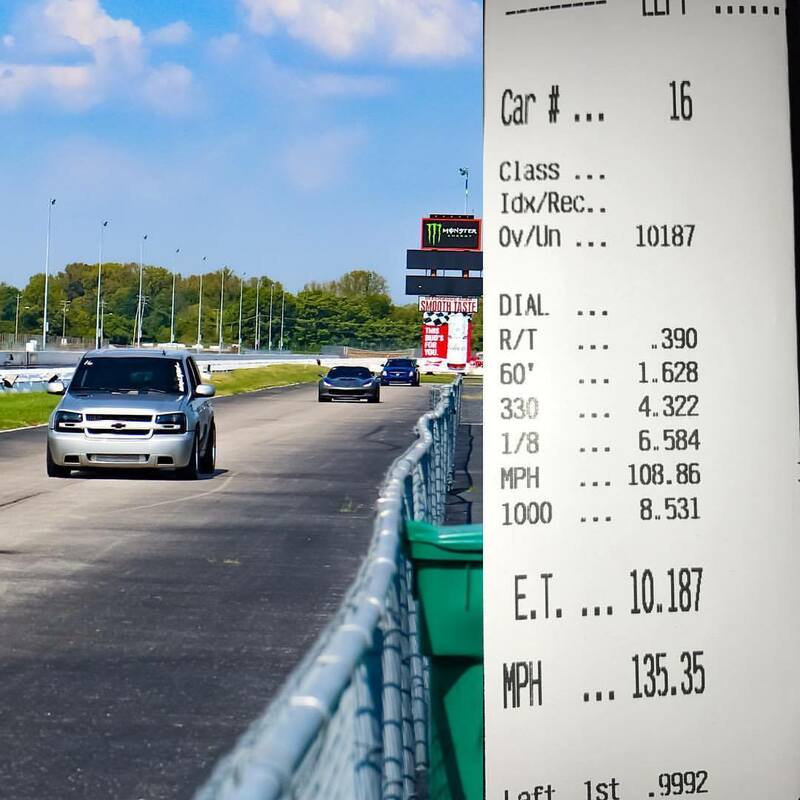 of 10.187 at 135mph in the quarter mile – not bad for a street-driven family hauler!